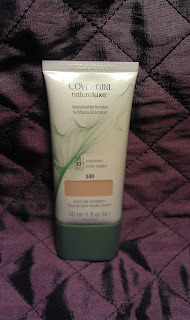 I've been waiting for this foundation to hit stores for awhile now, so I got a little giddy when I found it Saturday. First impressions: The packaging is nice, twist off lid and compact, great to just throw in your bag for on the go touch ups. It gives an really light clean coverage and you really can't feel it on your skin. Blends really well and the addition of the SPF is a selling point for me. Has a really pleasant fragrance too. The label says "Foundation, with a hint of jojoba extract and cucumber water, gives flawless, luxurious coverage with a barely there feel". It comes in 5 different shades: Flax, Bamboo, Sandstone, Dune and Maple. Well I've found its lived up to its promises. It really is a lovely light coverage foundation for day time wear. As an added bonus I got a free stainless steel drink bottle with my purchase!